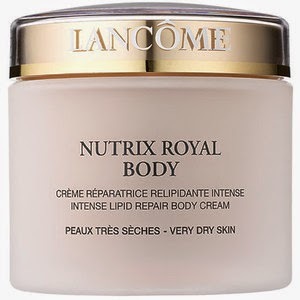 Lancome Nutrix Royal Body Cream is about as rich, luxurious and decadent as a body cream can get. The texture of the body butter was thick and dense in the jar, but remarkably silky and lightweight when I applied it to my skin. There was a bit of oily or "slick" feeling to the cream when it first went on, but within seconds it absorbed into the skin. My skin was immediately hydrated with a beautiful glistening sheen, which was perfect for my drier legs and feet. Equally as impressive, this cream gave me lasting moisture and relief from dry skin all day long - even in very harsh, cold temperatures. This cream is scented, and it's a very pleasant fresh floral that could double as a very light fragrance for the day. The scent lingered softly for a few hours on me but it was not overwhelming. Another plus: The jar is huge, and the cream is very concentrated (about a Quarter-sized amount is enough for several areas of the body each). So while this is not an inexpensive product, the quality certainly makes it a value buy, since you'll be indulging with it every day (trust me).